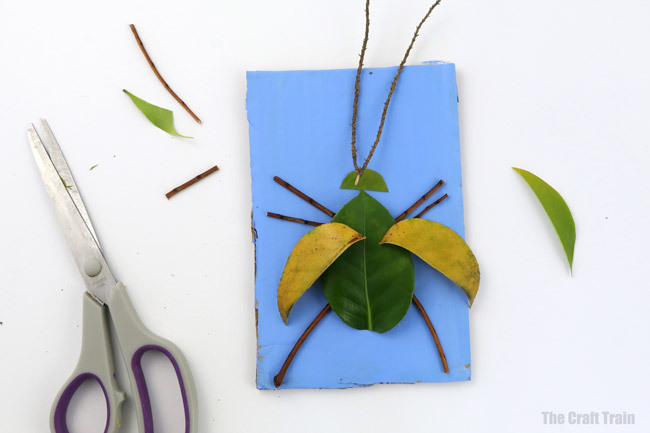 Make nature art bugs from leaves and twigs. They really pop on bright painted backgrounds made from recycled cardboard and make a fun wall art idea. 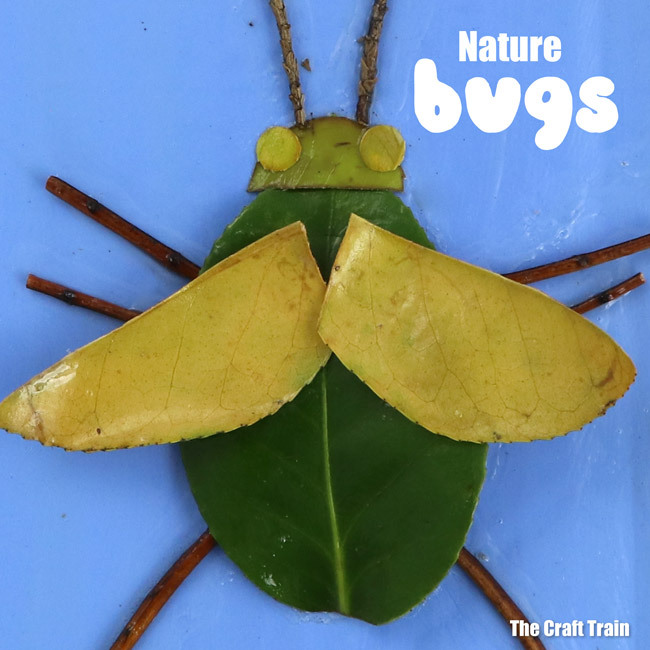 Insects – of all kinds – are fascinating creatures to explore and learn about. I have always found looking at them up close to be really interesting and have encouraged my kids to indulge their curiosity when it comes to bugs rather than their fear. This I have done by buying them non-fiction books packed with interesting facts and photographs of real bugs, and giving them things like bug catchers and critter keepers as gifts. I don’t encourage my girls to keep bugs for long, just to catch them and take a good look up close so they can learn to appreciate them before releasing them back into the garden. 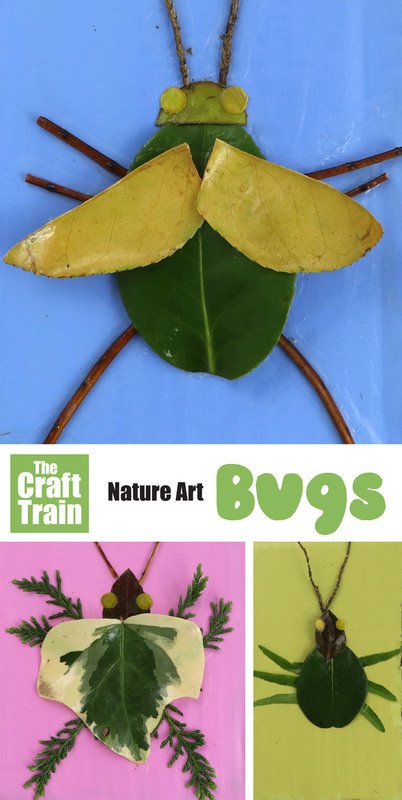 We have made lots of bug crafts in the past, some inspired by the real thing like our cardboard tube grasshoppers, and others more by fantasy like our Valentine love bugs. 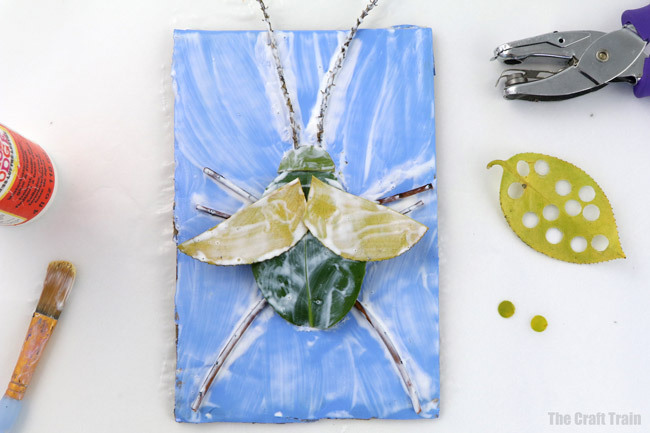 These nature art bugs are somewhere in between. They are inspired by the shape and look of real bugs, but are not based on any insect in particular. 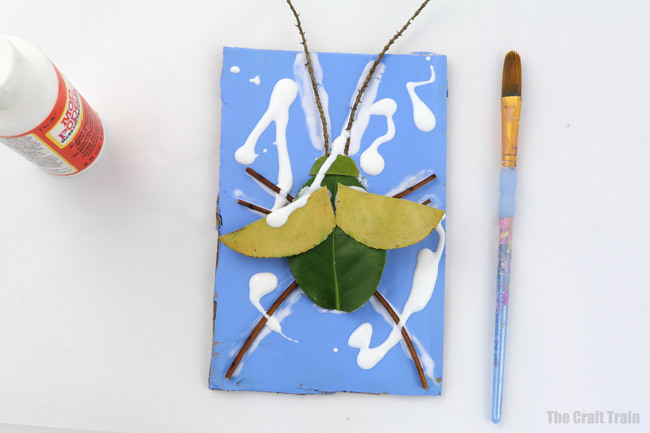 You can make this eco-friendly bug craft using recycled cardboard as the base and nature items collected from your garden as the key material. 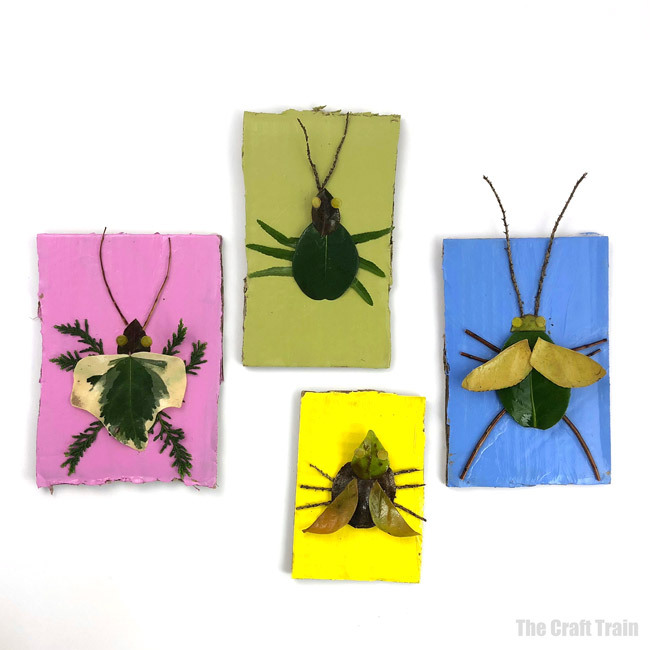 I’ve painted over these bugs with mod-podge. This helps to give them a glossy, shiny protective coat that will stop the leaves from crumbling and drying out although they may still fade, curl and brown a little over time. 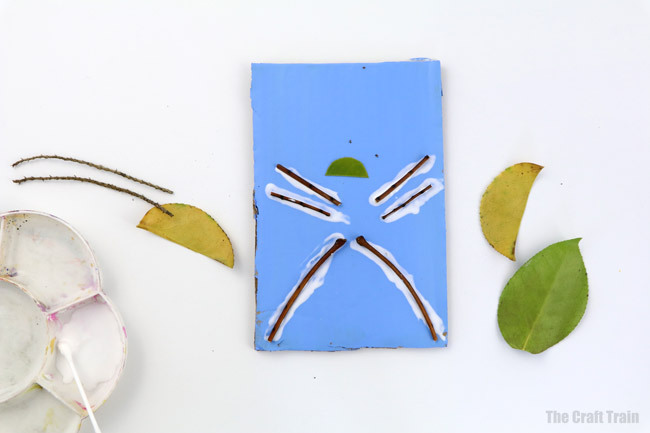 You can use store-bought mod podge as I have or make your own DIY version by mixing PVA glue with water at a 50:50 ratio. The natural materials I’ve collected to make these were all picked fresh from our garden because it’s Spring time here, but they would also look fabulous made from coloured Fall or Autumn leaves if it is that time of year where you live. 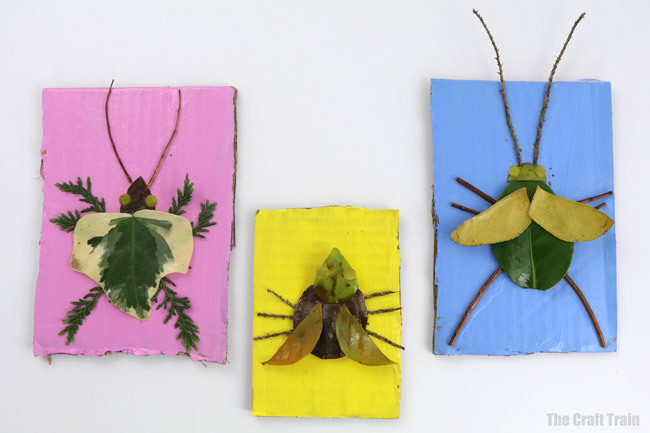 These nature bugs looks bright and cheerful hanging on the wall and can be held up with a little bit of blu tack. So what are you waiting for? 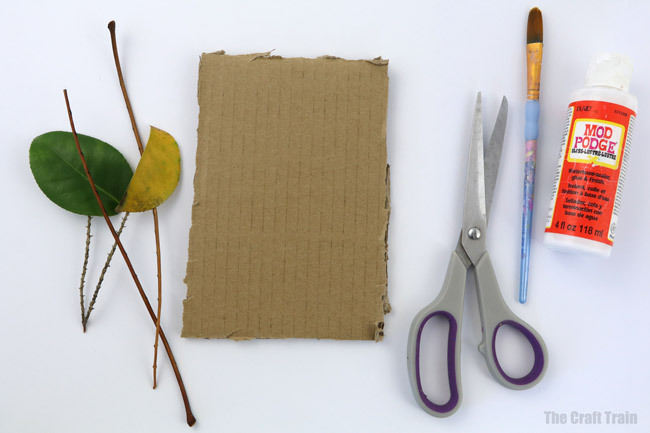 It’s time to get outdoors and start collecting some leaves! • These neon cicada shells look really cool!